Ready to get back on your bike after a cold, snowy winter? Before you head out for your first ride of the season, it’s a good idea to give your bike a quick tune-up first. 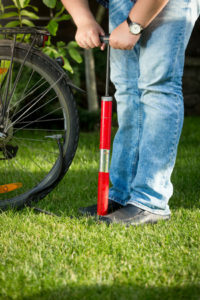 Here are a few steps you can take to get your bike ready for spring and summer. Put air in your tires. If you haven’t ridden your bike in a while, there’s a good chance your tires could use some extra air. Before you do anything else, pump up your tires until they reach the recommended PSI indicated on their sidewalls. Riding on underinflated tires can not only be dangerous, but also shorten the lifespan of your tires and make them more prone to punctures. Lubricate your gears and inspect your chain. The moving parts on your bike could probably use some fresh lubricant before you hit the road as well. Use a dry lubricant instead of oil or WD-40 to prevent dust and dirt from gumming up your gears after a few rides. Be sure to lubricate both the front and rear gears, the chain and all the moving parts in your crankset. Check your brake levers and pads. Are the brake levers on your bike a little loose, or have the brake pads worn out? Either of these conditions will make it difficult to stop quickly and effectively in case of an emergency. Brake levers can easily be tightened by adjusting the length of your brake cables, but worn-out pads will need to be replaced with new ones. If you want to make sure your bike is ready for peak riding season, stop by our shop for a tune-up from our full-service mechanics station. We’ll have you back on the road in no time!